Darshan Joshi shares an inspiring internship story at CommScope Inc. I came to the University of Maryland as a Graduate student in the Fall of 2016 deciding to spend my first American winter on campus. The university felt nearly empty, not unlike a ghost town. On a quest for warmth and motivation I began researching and applying for summer internships in the field of wireless communication/RF as I had recently completed my first semester in the Master's in Telecommunications (ENTS) program. On a Tuesday morning in January, I received a call from Mark Valadez, a recruiter at CommScope; it still gives me great joy to go back and reread his first email as it was one of those triggers of hope that paved way for the opportunity that followed. This internship would enable me to work at the physical layer of a small cell product. The internship was extended to me after two rounds of technical interviews by two senior software engineers at CommScope. I was interviewed about my past work experience, my understanding of cellular protocols and my ability to solve challenging problems in C and C++ programming. The CommScope university relations team is very professional and they ensure that your questions are effectively and promptly responded to. Following an efficient onboarding process, I was assigned to the CommScope, Chelmsford facility in Massachusetts. The group focuses on the development OneCell™, a C-RAN-based, award winning small cell solution. It takes a developer to appreciate the effort and time invested in perfecting a product so that the end user faces the bare minimum challenge in operating the interface. That is a key differentiator in today’s market and CommScope has certainly attained that respect with their flawless and innovative design that overcomes the need for cell boundaries and has created the ‘one cell’ post deployment. During my internship working in high-end engineering and next-generation technology, my humble experience as an intern can perhaps be categorized under the commonly accepted phases of the learning process: Cognitive, Associative and Autonomous. As an intern, you’re consumed with multiple thoughts and uncertainties. After a warm welcome, office tour and completion of the HR formalities, I was assigned my desk – my work abode for the next 12 weeks. Equipped with a personal white board, blank and ready for action, I didn’t take long to acclimate to my surroundings. In the Cognitive phase, you need to figure out objectives through interaction with co-workers. My manger provided the padding for this phase by empathically listening to my expectations for the internship and tailoring it to what he had planned for me. You know you are in the right hands when you do not feel restrained, but feel motivated to dive in. I had three projects to work on and a respective mentor for each during my 12 weeks with CommScope. This was a great way to provide a strong understanding of the product in a brief time frame. On my first day, I visited the product development lab and it left me thinking there is nothing as beautiful as figuring out the internal workings of a complicated yet well thought out product. I started my work on IEEE1588 protocol system performance analysis, automated the tests with shell scrips, and did the simulation using Spirent’s tool! It is hard to miss the fact that CommScope strongly promoted a culture of diversity and people work in harmony and mutual respect towards a common goal. This is the phase where one ‘connects the dots,’ I felt a ‘eureka’ moment every time I cracked a concept and saw my work materialize! As part of a project, I worked on the AGC performance validation and unit testing of a next generation product. I saw firsthand the value and importance of tasks such as documentation and presentations! I was mentored by a technical specialist on another project for the summer. My mentor had nearly four decades of research and development experience in the cellular industry. He always ensured that I focused on the bigger picture rather than limiting myself to performing what was assigned. The weekly Executive Speaker Series during this time was one of the highlights of my internship experience. 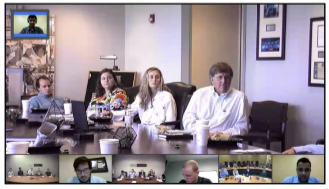 This series is intended to give the interns exposure to members of CommScope Executive Leadership team as they share their background, education, early work experiences as well as career development and how they ended up in their current executive position. One of the many learnings I gathered from this series was a statement made by CommScope CTO Morgan Kurk. “Avoid submitting a document/work that you are not proud of putting your name on!” This speaks volumes about keeping in mind the quality of work delivered as a matter of practice. Creation is the act or the process of bringing something into existence to disrupt the existing monotony and refine existing methods. My experience at CommScope was all about creating and it gave me immense pride to know that my contribution is a part of a next generation product. It also left me surprised that time had passed so quickly and it was almost time to say goodbye to the familiarity I was beginning to develop. For a graduate student in the ENTS program, CommScope is an ideal company to exercise your classroom learnings in a real-world environment. Aside from working with the concepts of wireless connectivity, I have become more cognitive about my own capabilities, limitations and sense of clarity as I commence my second year at the university in fall. Many of us are aware of the adage that “All work and no play makes Jack a dull boy,” but that certainly didn’t happen to me! With Social Fridays, the summer outing to Kimbal Farm, a memorable trek to the Flume Gorge, and a chance to explore Boston and Rhode Island over the weekends, these proved to be the ideal compliments that balanced my fruitful work experience. Maybe Jack should apply to work at CommScope! About the Author: Darshan Joshi is a second year ENTS graduate student at University of Maryland, pursuing Wireless, Networking, RF and Software Engineering as his areas of interest.